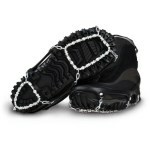 There’s a growing new category of winter traction devices out there for walking in snowy, icy terrain. Which this winter means basically every city and town in the Northeast, plus any winter hiking adventure in the backyard woods or deeper mountains. 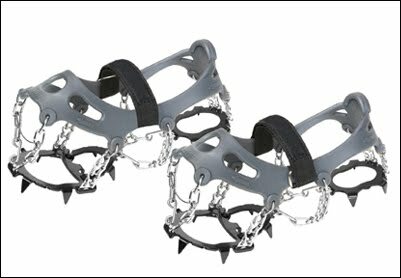 r of heavy-duty, indestructible steel crampons and a lightweight (and much less durable) system like YakTrax (left) or STABILicers (right). 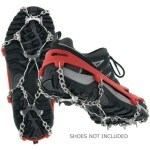 in STABILicers; most feature small crampon-style points. These new systems are also designed to fit on any type of footwear, from hiking boots to running shoes. 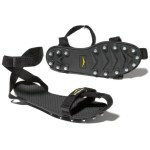 They are much lighter and more packable as well, especially compared to a pair of full-on steel crampons. The category is epitomized by the Kahtoola MicroSpikes ($60; pictured left), which debuted 4-5 years ago (read my MicroSpikes post for more). This past year saw two new entrants into the traction system market. 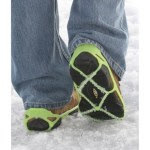 First is the Kako ICEtrekkers Diamond Grip Traction System ($40; pictured at top), a much beefier take on a YakTrax design that uses steel beads strung on aircraft cable for traction. Second is the Hillsound Trail Crampon ($60; pictured below), a beefed-up version of the MicroSpikes featuring more aggressive points and greater fit security across the instep. This new category provides an excellent all-purpose solution for everything from walking the Northeast’s icy sidewalks to winter hiking in the mountains. Though if you’re headed into very steep icy terrain, you’ll still want a pair of traditional crampons with front points and rock-solid stability on your foot (no shifting underfoot).